As one works with their genealogical database, it often is between the many other things one does in day, a week, a month or even longer depending on one's schedule. Opportunities of time sometime appear out of no where, taking advantage of these situations can be tricky. Depending on where you are can determine whether you would be able to access your data files. Being at home really doesn't count unless you want to use a lap top while watching a favorite TV show instead of being at your main computer which is also another option and reason to use Dropbox. 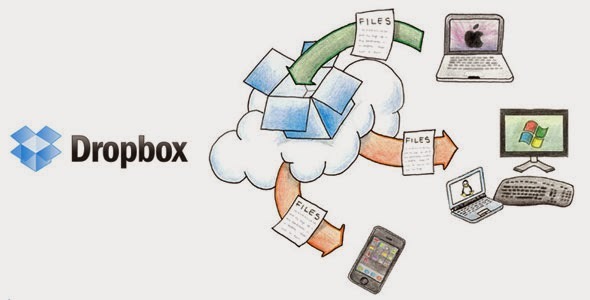 Using Dropbox has become one of the easiest ways to manage both my own database and any additional documents and photos for my database. 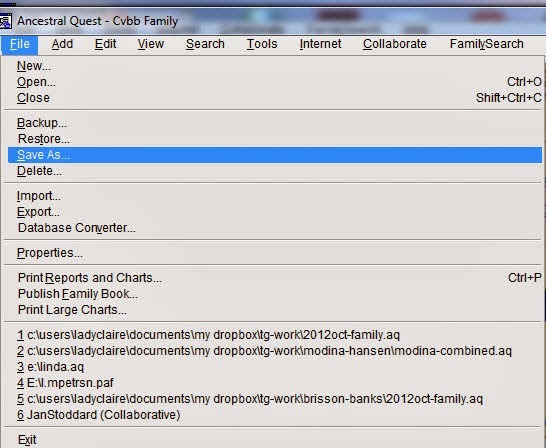 Currently I keep my Ancestral Quest database in Dropbox. This means no matter where I am, as long as I have internet access, I can access my database on my own lap top. In addition, I can take photos with my smart phone and also add them into my Dropbox. Once I am home, the photos will automatically be there on my own computer because they are accessible through Dropbox. This is a tremendous help when traveling as I know my pictures are safe and I will be able to link them to my ancestors. To create an account go to http://www.dropbox.com and click the "Sign up" button to enter in your name, an email and a password. You can add other computers and an android to the one account and have everything linked together. You are allowed up to 2 GBs for free and of course they have additional storage for a price. This will cause a new menu box to come up and allow you to determine where to save your AQ database file. 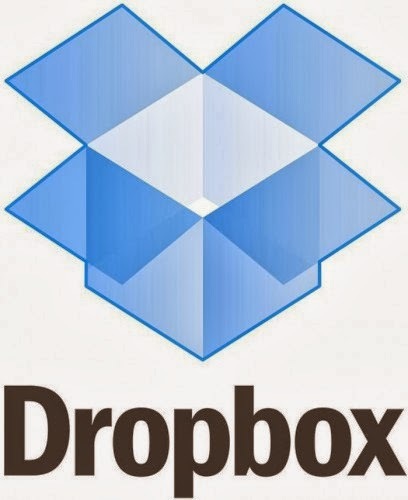 It is at this point that you click the "dropdown arrow and change it to "My Dropbox", once you have selected that you can name the file the same name you currently have or give your database a new name and click on "Save". This has now placed your current database file in your Dropbox file. Close your Ancestral Quest program and re-open it, go to File, Open and look for your new file in the Dropbox where you just saved it. Once it is opened you'll always have it there and AQ will remember where to look for your file. AQ Basics or AQ Full Version? Choosing between Ancestral Quest Basics and Ancestral Quest Full Version can prove to be confusing. Sometimes one requires time to check out a program and to see if the program is for them. Ancestral Quest runs on the Windows operating system and provides a way for anyone doing genealogical or family history research to record their findings. This program is easy to learn and packed with many wonderful features. For individuals who were using PAF, it is an easy switch over as it was created from the code provided by Incline software in 1999 making users feel right at home using the screens, reports and other functions that are so familiar to them. Ancestral Quest (AQ) was also the first desktop family tree program to be certified to access, update and sync with the family tree database of new.familysearch and is now Family Tree Share Certified to work with the new Family Tree. To add to the value of AQ, it is the only software certified to share data between PAF 5 and the FamilySearch Family Tree! So just what is the difference between the two programs besides the cost? AQ has developed a chart to help you decide which program is for you. We think you will be amazed at all the features and great tools available in Ancestral Quest. Combining this with the ease of use and technical support is a win win for all!